Posted on August 3, 2014 by revivewa	in Features, Profiles and tagged 1, feature, Life-giving, Mowanjum. Just four weeks before this edition of ‘Revive’ went to print, Gail Cresswell packed up her things in Margaret River, in WA’s south west, and moved to Mowanjum, a remote Aboriginal community in the north of WA on the outskirts of Derby. With a passion for education in Indigenous communities, she is starting up a Montessori program for kids under three. It is also a system that has been highly successful in Indigenous communities around Australia. Towards the end of August, Gail and her assistant, Daphne Gilbey, a member of the Mowanjum community, will be attending the Thursday Island Montessori Summit where they’ll be exploring the benefits of the Montessori approach in Indigenous cultures. “Everything has got to have a purpose,” she said. “So we grate carrots and we squeeze oranges. So it’s all for a reason – it’s not just a futile exercise. “And that’s one of the things where I see the discord in regular education, is that most things for Aboriginal kids have got no meaning. And so they just do it because they have to. 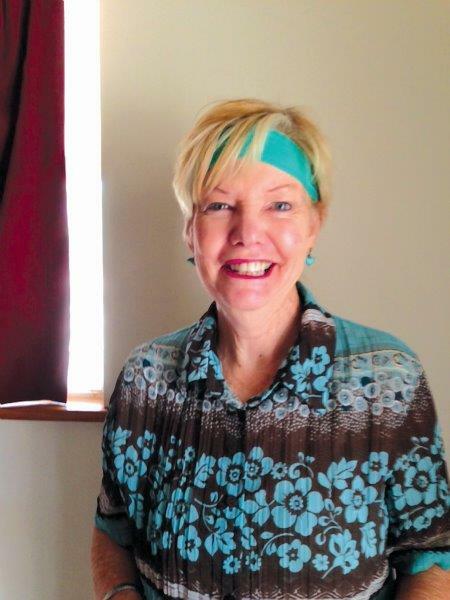 Gail Cresswell waring a headband made for her by a student from the Mowanjum Community. Gail is not new to Montessori education; her previous position was as the principal at Margaret River Montessori School where she had just started up a similar program. She’s also worked all over Australia, including as the founding principal for a school in the remote community of Pia Wadjarri, in the Mid-West region of WA. The Mowanjum Early Learning Centre, run by the Mowanjum Parents and Community Engagement Project is a three-day a week program where Gail will also be training up women to work at the centre – a template which is already working in the community at the Computer Resource Centre and Breakfast Club which have been supported by the Boab network, an outreach of All Saints Floreat Uniting Church. Revive has previously reported on these programs, including the school holiday program where a group of people travel up to Mowanjum from Perth to run activities for kids during the school holidays. For Gail, this project all started back in May 2013 when Mowanjum celebrated the centenary of their relationship with the Uniting Church. Gail attended the celebrations and was moved to give something back to the vibrant community. As soon as she returned home to Margaret River, she started making plans to set up the centre. Having received a government grant and support from the Boab Network, things have finally fallen into place. But it hasn’t been without its challenges. Part of the reason why life is so tough up there, is the high cost of living in the North West of Australia. A high suicide rate also brings an immense sadness to the community and staggeringly low school attendance makes this program all the more worthwhile. In Gail’s program, she is finding that it will benefit the whole community as more and more people get involved. “Even though it’s for the little ones, everyone else drops in,” she said. “I’m often doing stuff with older kids. Having also taken on a role as a prison chaplain, Gail is able to keep a positive connection between the community and the prisoners, many who are related or are friends. She plans to take photos from the centre to relatives in the prison to keep hope alive. Great article. Great program. All the best Gail. Sherryl (Skippings) Smith.